This article continues from our previous SSD report by focusing on the performances and efficiency of the latest 480GB-512GB SSDs. The SP920SS from ADATA, which uses Marvell’s controller IC chip and features Synchronous MLC NAND Flash, comes with a total capacity of 512GB. During testing, the SSD's highest read and write speeds were 522.95MB/s and 423.40MB/s, respectively. The numbers are noticeably better than the highest read and write speeds recorded from the 240GB model. 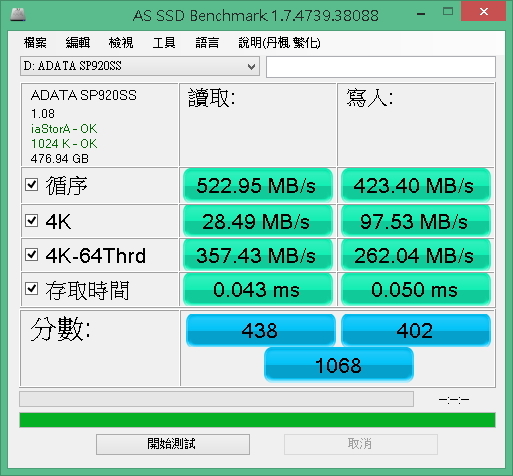 Under the AS SSD test, ADATA's 512GB SSD performed relatively well, earning a total score of 1968. The SP920SS's score here, which reached 4375 in the 1GB category, was equally impressive. 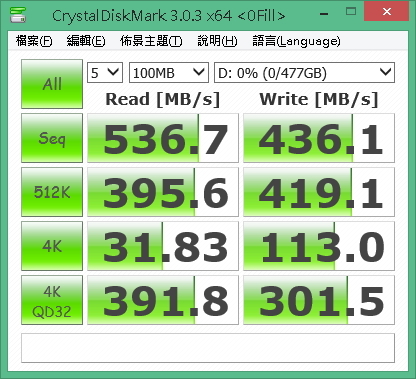 When tested with CrystalDiskMark, ADATA's SSD showed exceptional numbers and performances, with the average read and write speeds exceeding 500MB/s and 400MB/s, respectively. Gigastone this year sent us its Prime Series SS6200 SSD, which features the SMI2246EN controller IC chip and Intel's MLC-based NAND Flash. It also comes with a total capacity of 512GB. When tested, the SSD's read speeds are able to reach as high as 527.3MB/s. 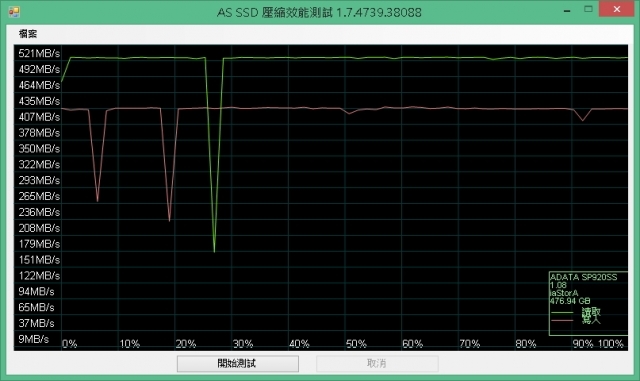 Under the AS SSD test, the SS-6200 managed to accumulate a total score of 608. The SSD's read speed tends to fluctuate at times, as can be seen in the diagram above, but the overall magnitude of the fluctuation isn't significant. The write speeds on the other hand were more stable despite showing a significant jump at a certain point. When tested with Anvil's Storage Utilities, Gigastone’s 512GB SSD showed an impressive score of 2836, which is better than many of the SSDs tested. The SS6200 SSD's score here was as good as expected in all of the categories tested. Kingston's Savage 480GB, which is powered by the Phison 3110 processor, features the SATA3 Interface and MLC based NAND Flash. When tested with AS SSD, Kingston's SSD earned a highly remarkable score of 1174, and showed very stable write speeds. Its performance is one of the best among the SSDs tested. Kingston’s SSD managed to impress once again, earning an average score of over 4900. 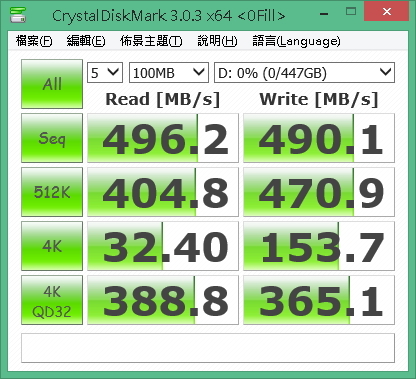 Under the CrystalDiskMark test, the Savage 480GB SSD's score was much higher than many of the SSDs tested. This is mostly thanks to its use of a highly impressive chip. Micron's Crucial MX 200 SSD, which features the company's in-house NAND Flash memory and Marvell's 88SS9189 processor, features a total capacity of 500GB. Both the MX 200's reading and writing speeds were impressive under the AS SSD test, and its total score of 1109 was much higher than many of the SSDs tested. Under this benchmark test, Micron's SSD excelled with a total score exceeding 5200. Micron’s MX200 showed an equally remarkable performance here, and its numbers were all in line with what we expected. OCZ is a popular brand known to be favored by tech enthusiasts and general consumers alike. This year, the company sent us its Vector 180, which features 480GB of storage and uses OCZ's Barefoot 3 M10 controller IC solution. The SSD also features Toshiba's A19 MLC NAND Flash chip. 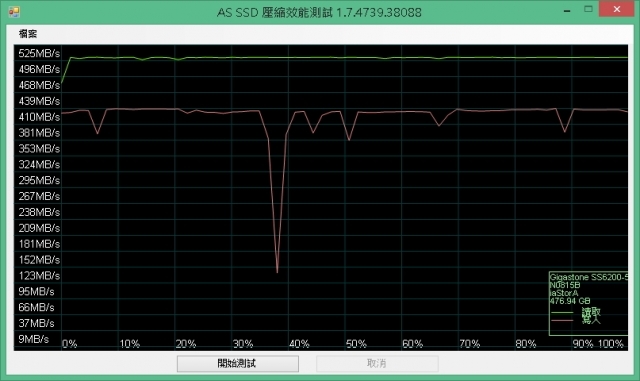 When tested with AS SSD, OCZ's SSD showed a great all-around performance, with an impressive score of 1172. The Vector 100 ended with a total score of 4200 here, and showed impressive performances in many of the tested categories. As expected, OCZ's SSD performed exceptionally well in the CrystalDiskMark test, with numbers that are all above average. The SSD 370 that was sent to us this year by Transcend features a total capacity of 512 GB and features Synchronous MLC NAND Flash. 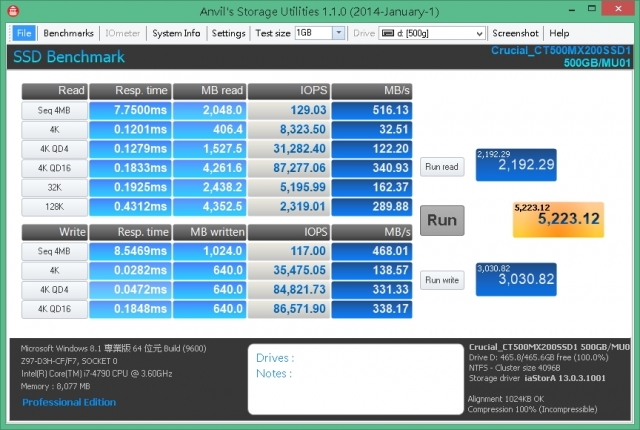 In the AS SSD test, Transcend's SSD 370 earned a total score of 970, which is decent. Its read and write speeds, likewise, were fairly good. When tested with Anvil's Storage Utilities, Transcend's SSD ended with a total score of 4221, and showed great IOPS scores. The scores earned by Transcend's 512GB SSD here were equally impressive, especially in the seq category. Most SSDs featuring 480GB-512GB of storage are known to be ideal memory solutions for business individuals and enterprise groups. Although the 500GB SSDs we tested this time are based on the SATA 3 interface rather than the advanced PCIE interface favored by enterprises, many of them can still be very useful for basic functions, including improving laptop and desktop performances and enabling PCs to have higher storage capacities. 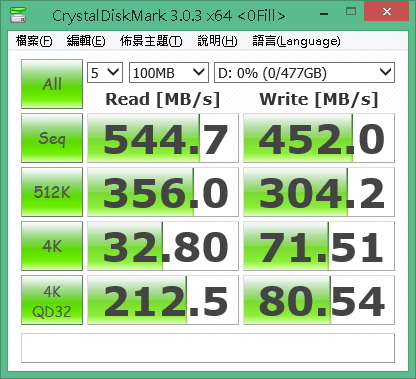 Below are some of the 480GB-512GB SSDs that we would recommend, based on the test results.